Our hearts and heads need a story. We need a story about, in Douglas Adams' phrase, "life, the universe, and everything." We need that story to be both scientifically respectable and spiritually relevant. Evolution provides a scientifically respectable story about the emergence of life. Moreover, more and more people are understanding and telling that story in a way that is spiritually relevant. The theory’s basic idea is that complexity builds up from simplicity. Life is an emergent property: it emerges from billions of lifeless mechanical processes all going on together. Mind is an emergent property: it emerges from billions of mindless reactions all going on together. Religiously, we might say that God, too, can be seen as an emergent property: the sort of knowledge and power commonly associated with God are the product of the trillions of complex algorithms interacting, not the cause. Evolution does not present us with a linear picture, a straight line of development. Instead, evolution presents a picture of a tree of life, starting at a single point and branching off into the various species. There are billions of branches on that tree. The vast majority of them terminate before reaching the present. 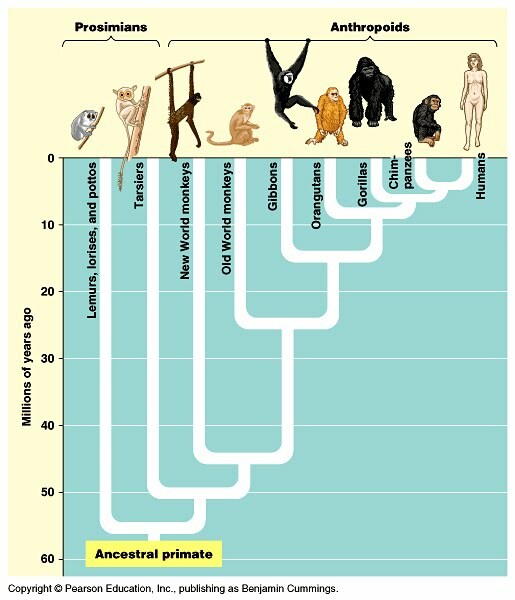 And there we are, we homo sapiens, at the tip-end of one twig. Once you see how the process works, then you see that process isn’t aimed at any of the billions of species it has produced. It’s just algorithms cranking away. 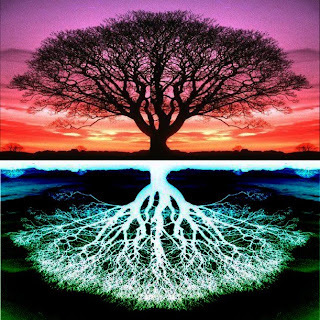 This nonlinear picture of a tree of life spreading, spreading, spreading, means that if evolution has a direction, we cannot characterize that direction as toward any one particular species – or even any one particular genus or order or class. Now we get to a question that scientists are still divided on: Is evolution headed in any particular direction? In terms of species, evolution is heading in billions of directions all at once. 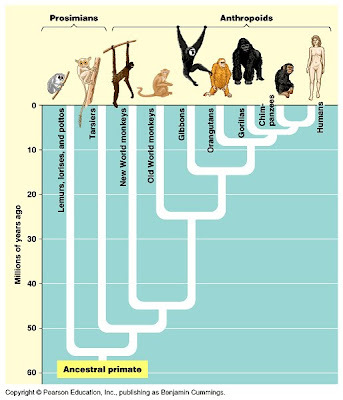 The common ancestor of humans and chimps lived about 7 million years, the common ancestor of gorillas, chimps, and humans, about 10 million years ago, and the common ancestor of orangutans, gorillas, chimps, and humans, about 14 million years ago. This means that we are more closely related to chimps than we are to gorillas – and it also means that chimps are more closely related to us than they are to gorillas – they are, in fact, exactly as far removed from gorillas as we are. If the tree is a good-sized oak tree, then our twig goes back only about an inch before reaching the point where the twig leading back out to the chimps branches off. There. Our place in the grand scheme of things. On the chimpanzee twig. 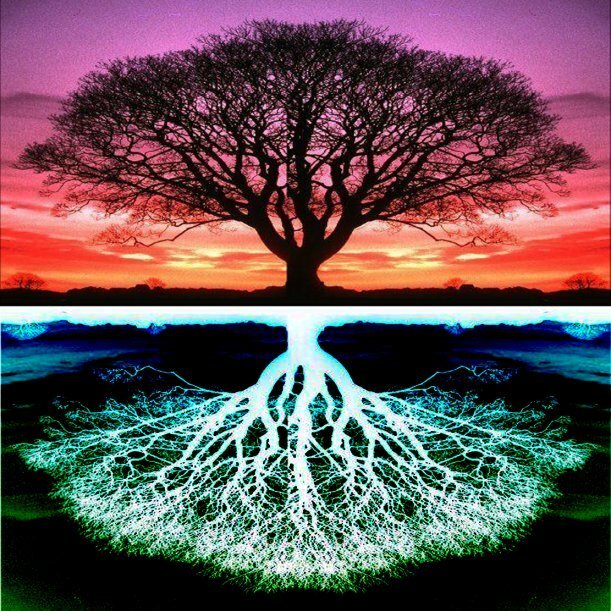 This story of a growing, branching tree of life is a story that tells us about who we are, how we got here, what our place is. It’s scientifically reputable, and at the same time, for many of us, spiritually relevant, for it is a story of interconnection. It’s a story that shows us to be the product of grand, noble and creative forces beyond our control -- and also shows us to be the recipient of grace – that is, of gifts that we have done nothing to deserve. Put it rather this way: you are a fluke of the universe, and so are the trees and the stars. This is part 3 of 7 of "Eschatology: Evolution's Arrow"
Next: Part 4: "Would-a, Could-a, Gould-a"
Previous: Part 2: "Squeezing Science for Spiritual Juice"